Home ownership is one of the most rewarding and the most frustrating parts of your life. While building equity and having a place of your own is a wonderful feeling, sometimes it seems like there is no end to the amount of money that it takes to keep a home in great shape. Because we all spend so much time focused on maintaining the inside of our homes, we can miss when things start going wrong outside, especially on the parts of our property that we expect to be able to handle a lot. While you would notice the grass in your yard dying, concrete repairs might not be as easy to spot, at least not right away. At B&B Concrete Lifting, we have decades of experience helping people keep their concrete level and in great shape. Contact us today if you would like us to see if your concrete can be repaired before spending a lot more money having your slabs repoured. Chances are good that if you call us as soon as you start to notice your concrete beginning to crack of sink, we can repair it for a fraction of the cost of replacing a slab. Keep reading to find out more about B&B Concrete Lifting and to learn about the reasons your concrete might be sinking and why it is so important to have it repaired by professional concrete lifters. 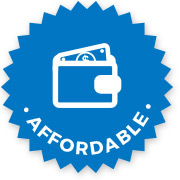 Call us today or fill out our online form for a free estimate! Even if you have lived in your home for years, there is almost no way to predict if your concrete will start to sink, tilt, or crack. The process is usually slow and can take years or even decades to become noticeable. What is it that causes concrete to sink? The answer can be fairly complicated, but there are generally two primary reasons: erosion/soil washout, and compaction. Soil washout occurs when improper drainage or a deluge of water underneath your concrete slabs carries away some of the soil underneath the slabs. Some amount of washout is normal, but when the process of erosion goes on for years or through an exceptionally wet season, the missing soil can lead to a void. While small voids usually don’t cause any real problems, if a void is large enough, it can cause your slabs to start to lean towards that void. This void is where sinking and tilting occur, and these are the first signs that there is an empty space under your concrete. If the void isn’t filled in time, the slab can start to crack and crumble. Compaction is the process of the soil being pressed down due to the weight and pressure of the concrete slab, as well as any other weight put on the slab over time. Like erosion, some compaction is normal, but it can become a problem if the area was poorly prepared before the concrete was poured. 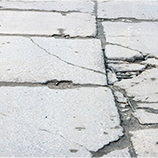 Like erosion, compaction can cause your concrete to sink or tilt and eventually crack. 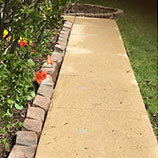 While it is impossible to see if the soil underneath your concrete has been washed out or compacted, the effects of these two processes are visible. If you notice a dip when you are pulling your car onto the driveway or you find yourself tripping on your sidewalk, you may have a problem. Luckily, B&B Concrete Lifting can help! 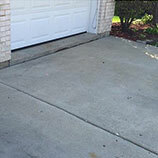 Our concrete repairs are incredibly effective, long-lasting, and much more affordable than having new concrete poured. Contact us to learn more or keep reading for more information about our process. At B&B Concrete Lifting, we use a technique called concrete lifting (sometimes referred to as mudjacking) to restore your concrete to a proper level. The process itself is fairly straightforward but it requires special equipment and a lot of experience to make sure the job is done the right way. The process begins with us performing a thorough inspection of the concrete slab and the area around it. During the inspection, we are looking at the overall shape that the concrete slab is in, as well as what way have caused your concrete to start sinking and shifting. We covered these causes in more depth here, but we’ll briefly explain them again. Sinking slabs are generally caused by one of two factors: compaction and erosion/washout. Compaction occurs when the material under a concrete slab was improperly tamped down before the slabs were poured. Over time, the weight of the slab (along with anything resting on the slab) presses down on the soil and flattens it. Your slabs will then start to sink and may crack if the compaction does not occur evenly. Washout, or erosion, is caused by water moving through the soil under your slabs. While some erosion is completely normal, if the drainage around your slabs wasn’t designed with your concrete it mind, large amounts of this material can be carried away. When the soil is washed away, your slabs will start to sink and crack. After we have completed the inspection, we will provide you with a free quote that lays out how much it will cost to repair your concrete. If we notice some drainage problems, we will be sure to let you know about them. We are happy to schedule your concrete repair whenever is most convenient for you, so please give us a call whenever you’re ready and we will arrive ready to make your concrete look outstanding. Our small crew will arrive, on time, to your property and start working quickly. We drill a hole into the slab that needs to be lifted, insert a hose that pumps a specially formulated material into the space underneath your concrete. This material has been designed to expand to a certain size, lifting the slab up as it expands and hardens. This is one of the most complicated parts of the process because it requires the knowledge of just how much material to use in order to raise the slab to the proper level. Luckily, we have decades of experience lifting concrete and we have successfully performed hundreds of these jobs. After we have drilled the hole and filled the void, we will patch the hole with fresh concrete. Within just a few hours you will be able to drive on the slab again! Our customers are always surprised at just how simple we make the entire process. Even for extremely large slabs, or a large number of slabs that need mudjacking, the process can usually be finished in less than a day. Contact B&B Concrete Lifting today to learn more about our concrete repair services in the Chicago area. Choosing B&B Concrete Lifting to perform your concrete repairs is beneficial for many reasons. The first and, for many people, most important reason to choose lifting is that concrete lifting is a much more affordable way to repair your concrete than other methods. Repouring slabs is even more expensive than having them poured the first time. A crew has to come to your property, jackhammer out and remove the old concrete, relevel the ground, and then pour new concrete. This is never a cheap option, and it doesn’t mean that the same problems that existed before will be fixed. If the crew doesn’t address a drainage issue or they don’t tamp down the soil well enough, you might be right back where you started. Add in the noise, the disruption to your daily routine, the inability to walk or drive on new concrete until it has completely set, and the possibility of damage to other parts of your property (including your lawn), and new concrete quickly adds up to be too much for most people to handle. While some companies will arrive at your property and patch the cracks, they aren’t treating the underlying causes that are making your slabs tilt or sink in the first place. While that kind of concrete repair may look great for a while, eventually you will see your slabs crack again. As we mentioned above, if new slabs are poured on an area that wasn’t prepared correctly or if drainage problems have not been treated, you will quickly see new slabs off-balance. 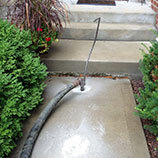 The special material that we use in our concrete lifting process will not compact and will not be washed away by water. While you might not notice sinking slabs right away, over time the dips and raised edges can create safety hazards. We don’t have the mildest winters in the Chicago area, and you don’t want to have any more tripping or slipping hazards on your property than the ones Mother Nature is already throwing your way. Failing to address these hazards, even if they seem minor, can have significant repercussions, both legal and financial. If you have a driveway or sidewalk that is uneven, tilted, and starting to crack, give us a call here at B&B Concrete Lifting. We offer free estimates and our concrete repairs are much more affordable than having new concrete poured! 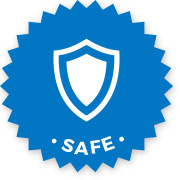 Contact us at B&B Concrete Lifting in Chicago to find out how we can make your St. Charles and Fox Valley properties safer and even better to look at! Our concrete repair services have made a world of difference for many property owners in the area and we would love to help you, too! We always offer free estimates and excellent prices on our services. Finding a company you can trust to perform any sort of repair or maintenance on your property can be difficult. At B&B Concrete Lifting, we want you to have the best experience possible when you choose a concrete lifting company, which is why we have put together this little guide to help you find the right company. One of the best ways to find out what kind of company you are dealing with is to read reviews. There are many places for customers to share their experiences online, so do some sleuthing to find out what people think. Make sure to actually read the reviews, though. Star ratings are usually a good indication of whether or not a company upholds a high standard of quality, but reading reviews will let you know for certain whether someone is worth trusting or if the reviewer may not have the same standards that you do. Check out some of the reviews from our customers, here. Having a background in concrete repair is great, but unless a company understands the process from start to finish, they may not be as qualified to perform high-quality, long-lasting concrete lifting services. At B&B Concrete Lifting, we have decades of experience with concrete from mixing to pouring to lifting. We’ve seen it all, and fixed most of it! Contact us today if you have questions about our concrete lifting services or to schedule your free estimate. The earlier in the season you call us, the faster we will be able to complete your job. 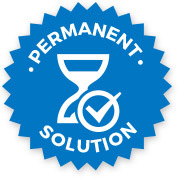 Even in the height of the busy season, we can still get your job done faster than you might think! For more information about our business, check out the rest of our site. We have a blog where we talk about concrete lifting and how it can help your property look better, and you can see some photos of concrete lifting projects that we have successfully completed for our happy customers. Reach out to us today so we can repair your concrete slabs!